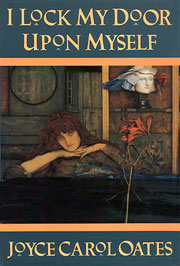 In 1891 Belgian symbolist painter Fernand Khnopff was struck by her words and turned them into an arresting image. 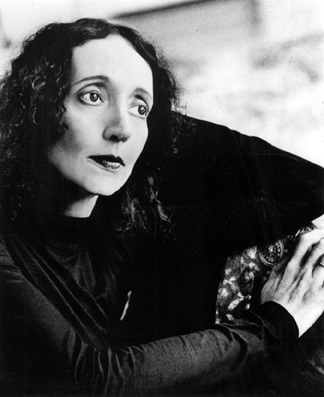 In 1990 American author Joyce Carol Oates took the painting and its title for a 98 page novella while also reaching back to the ideas of self-loathing and God’s deliverance behind the original poem – crafting a story with themes of isolation, paganism, race relations, feminist non-conformity and speculation about the past all wrapped up in an Ethan Frome-style of plot and the language of a dream. The story is that of Calla (official name Edith) Honeystone, a distant, alienated young woman with no use for human company, preferring to wander into the woods, passive-aggressive in her defiance of convention. Her story is only guessed at by her granddaughter. …there was Calla Honeystone tall and skinny yet thriving….this girl so mature to their eyes she might as easily have passed for twenty years of age as for fourteen; who might have been of unusual intelligence and sensitivity as plausibly as she might have been touched in the head. “Touched in the head”: Calla knew what people whispered behind her back, even her mother’s people, and she was both outraged in her pride and strangely pleased for, somehow, yes she liked that thought, that idea, “touched” by the finger of God Himself: compelled to live out a special destiny none of the fools and idiots and commonplace sinners around her could guess. The granddaughter is an amorphous character, her story seemingly patched out of old accounts, family gossip and sympathetic imagination, recasting the possibly crazy Calla as a non-conformer, wanting more than to be viewed simply as a wife and mother. It gets interesting when you realize that this granddaughter never knew Calla and has no idea what this recluse thought of anything. Madness as genius and madness as the creation of a patriarchal society are thus her speculations. The two women are tied by blood but the passage of even a single generation in between creates a gulf of unknowing and as a result all the facts are available but all motivations are a puzzle. The defining moment in Calla’s existence comes after her marriage to German immigrant farmer George Freilicht and after the birth of their three children when she meets Tyrell Thompson, black itinerant water dowser. In the aftermath of their affair she withdraws into seclusion for 55 years before dying. She is drawn to Tyrell Thompson immediately and it is here that the real layers of the novella are to be found. Calla is every inch the outsider and Tyrell Thompson is in an even worse position than herself socially. If you wanted to you could interpret their whole relationship as an allegory of race relations in the early 20th Century. Personally I doubt that was Oates’ whole intention – in her books things don’t tend to be so clear or so moral in design. Often she stayed out from school to tramp about the fields and woods and along the creek, gone sometimes for entire days when she’d show up at a neighbor’s farm like a stray cat or dog Oh is it Edith Honeystone? and she’d say I’m Calla in that low assured matter-of-fact voice, not so much certain of herself and of her welcome as indifferent; simply not caring; as ready to turn and wander back into the woods as to come into a house and be fed like any normal child. From this view it is the story of two humans in the thrall of the wilderness and that adds an element of hubris to the downfall of Tyrell Thompson – whose modesty over his power evaporates on the final day when he explains his plan to Calla. …the impromptu nature of it, the defiance, the flaunting and self-display and madness of it, the two to them rowing downstream to Tintern Falls on a day when anyone might see them who chose to see them, setting their course deliberately for the falls at Tintern that had not the power – so he boasted, or gave the air of boasting – to withstand Tyrell Thompson’s God-given mastery over water. Or maybe he just wanted to kill them both. Relationships between men and women in Oates’ world are habitually dark with undercurrents of violence and control. This one’s no different. Both threatened with death from her husband and the community at large, both seeming to fight with each other every time they meet – who’s stronger? who’s braver? who’s steering? who’s going to die first? She wished he’d strangled her: that would be an ending. She could not bear it that since loving Tyrell Thompson she’d become one of those women she had always scorned, quick to tears, bones like water, raw and demeaning hunger shining in her face Love me, love me don’t ever stop I will die if you stop. It seems almost a subconscious struggle which propels them into that rowboat. Unlike Ethan Frome and its ilk, this isn’t really a tragic love story except in framework. It’s all there is the original poem – the story is one of self-betrayal. From the beginning Calla is purely self-reliant, all ice and independence. Parent, husband, child all subjected in this way to her refusal to acknowledge them. The mystery at the heart of the little book is what it was that drove her, such a bold person, to retreat from life. Broken by a near-death experience? Broken-hearted from Tyrell’s fate? The granddaughter is obsessed with discovering the rationale she was too shy to seek while Calla was alive. Did you know it was Death that summoned you, a dowsing rod in his hand? Or was it Love? And were you faithful to him however bitterly however purposelessly all the days of your long life? But perhaps she was not broken, perhaps it was a choice made not to retreat from the world but to triumph over herself, over the part of her that was human. It adds to the religious element, for the idea of God threads the work without any clear resolution as to Calla’s faith or lack thereof. Joyce Carol Oates does not attempt to answer the mysteries of I Lock My Door Upon Myself. A smart move. To do so would be to spoil the effect. I absolutely loved this book, with its ability to inspire so much thought in less than 100 pages. One thing’s for sure, it demands to be reread. My first read found it beautifully told and mildly interesting, the layers only becoming apparent on turning back the pages. I’m not sure how it would do as an introduction to her work but for anyone already intrigued by her it is a necessary addition to your collection. Personally, I’m more and more convinced that she is a major American writer.